The new poetry workshop, aimed at KS2 pupils, are in line with the Primary school English curriculum. Tailored towards pupils from years five and six, the workshop will encourage those taking part to work in groups to create a poem about a chocolate machine. The aim of the workshop is to support the curriculum by developing the student’s understanding, whilst also encouraging an enjoyment of stories and poetry. During the interactive workshop, which is suitable for up to 60 children, pupils will work together to gain a greater understanding of different forms of poetry and will be given the opportunity to read a poem out loud. 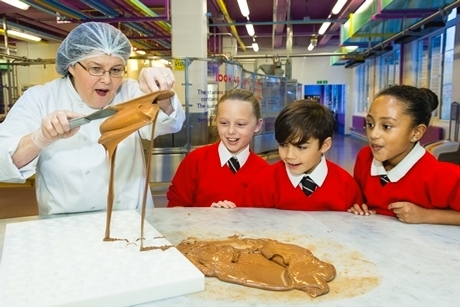 Cadbury World runs a range of educational tours, talks and workshops for Key Stages 1 to 5. Visiting schools can tailor their trip to suit the work they’re doing within class, with talks available on topics ranging from Geography, to poetry and the ancient Mayan civilisation. All talks and workshops have a curriculum link, whilst also offering an insight into the world of Cadbury chocolates. To support the launch of the new poetry workshop, the Birmingham based site is also running a school poetry competition, encouraging students to submit a poem about a cocoa bean. The winner will be announced on World Book Day (7th March 2019) and will win a class trip to Cadbury World, inclusive of a talk or workshop of their choice. Special rates are available for school groups of 25 or more and can include a talk or workshop. One free adult will be admitted for every eight children. For more information on the educational talks available, visit www.cadburyworld.co.uk/schools-and-groups.